The Iowa rental agreements are real estate contracts that are created for the use of a lessor, known as the owner/manager, and a lessee, known as the tenant, to come to a consensus of monetary funds for the use of property. All documents should be drafted after a verbal agreement has been made, the tenant has approved the property/space, and the landlord has verified all information about the lessee through the rental application. Rental Application – Verification tool used by landlords and managers to identify the tenant and check with their information provided to ensure it is true and correct. Association of Realtors Agreement – Has the option to be written as a fixed or month to month arrangement for residential tenancies. Commercial Lease Agreement – For the use of property that is allowed for businesses such as space for office, industrial, or retail purposes. Lease with Option to Purchase (Lease to Own) Agreement – Standard residential contract with a time period for the lessee to elect to buy the property if they choose. Month to Month Lease Agreement – Known as a tenancy at will and under § 562A.34 the landlord or tenant has the right to cancel with at least thirty (30) days’ notice. Room Rental (Roommate) Agreement – For the individuals renting the same space with separate bedrooms in order to manage the common areas and split the payments for utilities/services. Standard Residential Lease Agreement – For a common fixed-term residential arrangement. Sublease Agreement – When a tenant decides to rent the same property to someone else in order to cover them for the lease they are obligated under. 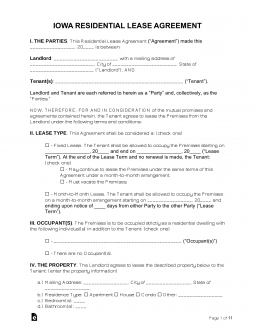 Termination Lease Letter – Form used to cancel a month to month rental arrangement in relation with § 562A.34. Agent/Landlord Identification (§ 562A.13) – Person authorized to act in the place of the landlord must be listed in the contract in addition to the address where notices are received. Lead-Based Paint – Federal law that mandates landlords and managers to inform any new tenant of the possibility of lead based paint if the property was built before 1978. Shared Utilities (§ 562A.13) – Landlord must disclose, only for shared utility charges, the rate at which the charges and services provided are billed to the prospective tenant. Comprehensive Environmental Response Compensation and Liability Information System (§ 562A.13) – If the property is listed in this database, provided by the Federal Environmental Protection Agency, it must be known to the tenant in their contract. Maximum § 562A.12 – The landlord may not charge more than two (2) months’ rent from what is written in the rental contract. Returning § 562A.12(3)(a) – Landlord is required to give back the deposit within thirty (30) days from the date the tenant vacated the property. According to § 562A.19 the landlord must give notice to the tenant within a twenty-four (24) hour period before entering the premises for a maintenance, inspection, or any other type of issue except for emergencies.